The career fair will be held online through video chat, allowing you to participate from your home or office. 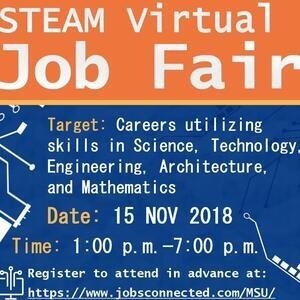 The Virtual Career Fair is a great way for organizations seeking to connect with students and alumni who are majoring in the STEAM (Science, Technology, Engineering, Architecture, and Mathematics) disciplines and are seeking full-time positions and internships. No travel is required and you can attend the fair from anywhere! - Employers and students will log in to the event from their respective locations (office, home, school, etc). - Students will enter the video conference room and the dialogue will begin. - Students and employers can ask questions about the positions available or candidate skills using the video conference feature. - After talking to the employer, students can apply for any positions the employer has posted. Students and Alumni majoring in Architecture, Landscape Architecture, City and Regional Planning, Construction Management, Interior Design, Engineering majors, and Science majors. A computer with internet connection, a microphone, and a video camera. Please note: Most laptops have built-in microphones and video cameras. For the best experience, a laptop with these capabilities is preferred but other microphones/video camera setups will work as well. You can also e-mail, the platform provider, at michael.oelbaum@jobsconnected.com, should you have questions or need assistance. Free, Must Sign Up in Advance through the provided link.